On Saint Valentine's Day morning I am reminded of the pieces of love around my home. This simple red card made by Olivia when she was in first grade. I have had it in my bedroom since she made this for me but this year I wanted it to have a new location. I love seeing this when I come downstairs. What a great little card. I bring out my favorite wedding photo two times a year. I display it after the Christmas decorations come down throughout all of February. I put it away until summer when it returns in June for our anniversary month. It's a constant reminder of the foundation that built this family. The blue glass lovebirds will always be found with this wedding photo. Just another sentimental item to remind me of marriage. About 6 years ago the big girls and I made valentine decorations for the house. 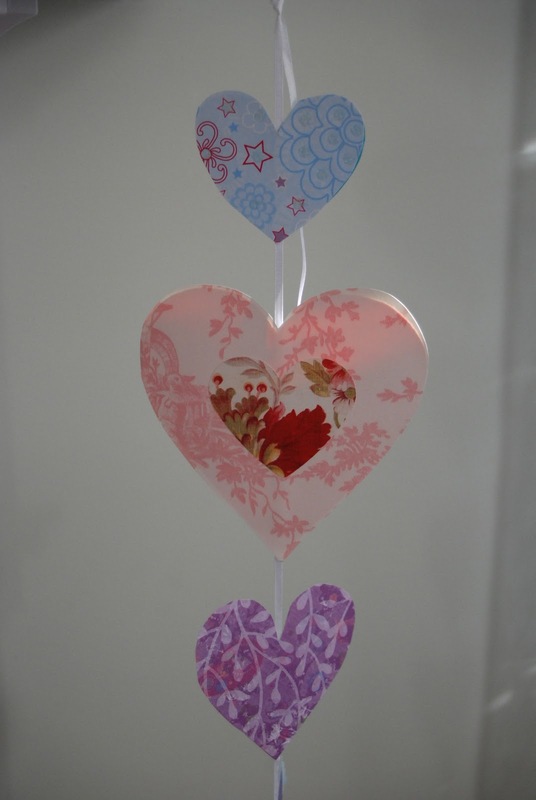 Hundreds of hearts were cut out and decorated. Plenty were sent as gifts but a few still remain in our collection. This string of hearts dangles from our mantel. Adelynn loves to watch the hearts twirl around. A few favorite red books and some beach pebbles from Maine. The blue pitcher is from Williamsburg where it was made by the glassblowing artisans. We love our colonial history in this house. The small flower heart bookmark is a water color painting which I adorned with some glitter. A valentine's day experiment a few years ago. Little pieces of love that remind us of the glory of being loved.